Q: Do I have to pay for postage/shipping? Q: Will they be able to ship to me? Q: I'm going on vacation. Can I pause my account? Q: I was approved for a product but it disappeared from my Vipon dashboard. Where did it go? Q: Is amzreviews.co.uk and amzreviewtrader.com the same as vipon.com? Q: How does the Best Discounts Button work? Q: What does reporting a seller do? Will I stop seeing their offers? Q How often does my daily voucher limit reset to 150? We recommend our shoppers get Amazon Prime to qualify for free shipping on MOST products. If a Seller has an FBA product (most of them do) then you won't have to pay for shipping with Amazon Prime. However, there are the odd Sellers that don't have FBA, so for these products, you may have to pay for shipping. Sellers who have shipping costs should have this charge factored into their offer price on Vipon. If the shipping hasn't been disclosed then you can contact the seller to see if the problem can be resolved. An FBA (Fulfilled by Amazon) Seller means the Seller's shipping is all handled by Amazon, which is why they are definitely able to offer you free shipping via Prime. FBM (Fulfilled by Merchant) Sellers' shipping is handled privately so they may or may not have the option of free shipping. This depends on where you are and if Amazon operates in your country. When in Vipon, you will see a flag next to the product - if it's a US flag, they ship to the US, if there's a UK flag, they'll ship to the UK. Unfortunately not. If you have purchased a product, the seller as well as ourselves, do expect your purchase to be completed within the normal timeframes. So you will need to manage this yourself and reduce your orders prior to your vacation so that you don't have pending purchase requests waiting for you while you're away. You have just seen an amazing deal in the Vipon Website, you press 'Purchase' and the next thing you know, you have been approved...success! Only you then find out the product has completely vanished from your Vipon dashboard, not only that, it's also not available in the Vipon site anywhere...Nooo! Please don't panic, this can happen at any time because when you request to purchase, remember that no payment has yet been taken from you at this point. As a shopper, you are here to help these businesses grow (some of which are small and just starting out). The Sellers usually have a limited quantity of discounted items, and when this stock runs out they have to remove it from Vipon. Please don't get disheartened by this process, it's just the nature of being an Vipon Shopper. Just go back and visit the site and look for some more awesome new deals that you can apply for. We promise to keep lots more amazing deals coming your way! For instance if you are searching for UK deals only. 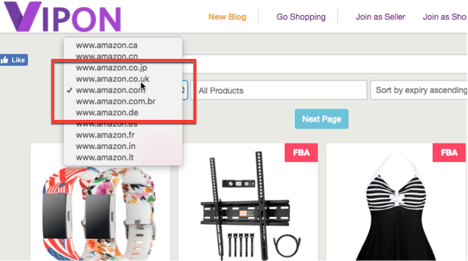 There is a dropdown menu where you can filter your search for deals to www.amazon.co.uk only. And, please know that any time we refer to Vipon, we are referring both sites. Q: How does the Best Discounts Button work? If checked it will only show products which are less than $5 or have a discount greater than 80%. Reporting a seller via your dashboard lets our system know that there has been a problem with this offer, and the product was never purchase. It doesn't get people in trouble, and only helps us to keep Vipon a better place. If a seller has too many report of problems, we pause their listings so that they can working on fixing their issues before more shoppers get sent out codes. Reporting a seller WILL NOT stop you being approved for deals from this seller in future. What we will do is simply give you a popup warning next time you apply for something from them. This gives you the choice if you'd like to deal with this seller again and try to get this working, or pass of the offer. Q: How often does my daily voucher limit reset to 150? Your daily voucher limit doesn't reset at the start of each month. Your allowance will be removed 30 days after acceptance and reset after those 30 days. For example: You are accepted for 5 vouchers on the 9th November then your 5 vouchers won't go back until your total until the 10th December.